not shown.....80 x 120 barn - arena/hay storage. All board includes hay and/or lush grass/legume pastures. 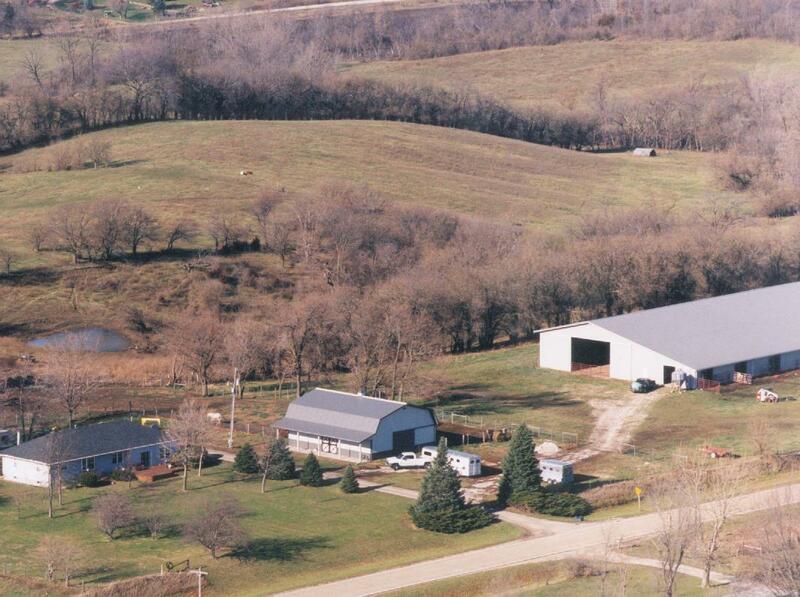 Board also includes access to our 60 x 152 indoor arena and our 60' diameter covered roundpen. All board is discounted (approximately) 10% if paid before the 10th of the month. pasture (shared with our horses): $200/month ($180 discounted rate) for year round board. A $20/month hay surcharge will apply to horses boarded only during winter months. Overnight stalls: $25/horse - includes hay and bedding. Paddocks for multiple horses - $20/horse - as available. Please note, we cater to the horse, not the human. So for the safety and comfort of our horses, we do NOT have heated stalls or heated arena. (Exceptions made for early foaling mares) We prefer our horses NOT be exposed to the dangerous ammonia and humidity levels present in heated stalls and/or arenas. Talk to your vet and you will find that horses are healthier/happier outside. However, if you have a show horse that needs a stall, we have a clean, healthy, well ventilated facility for them also!! Under Iowa Law, a domesticated animal professional is not liable for damages suffered by, an injury to, or the death of a participant resulting from the inherent risks of domesticated animal activities, pursuant to Iowa code chapter 673. You are assuming inherent risks of participating in this domesticated animal activity."